Jumo’s new heatTherm P300 3-phase panel mount thermostat is available with a maximum switching capacity of 30 A/480 V. An important new safety feature capability is the trip-free function. The electromechanical thermostat can be operated without additional auxiliary energy and is available with various connections such as tab connectors, screw terminals or push-in connections. Examples of application areas include electronic screw-in heaters or deep fryers and hobs in the food industry. The device is also available as a safety temperature limiter. In the event of a malfunction, the P300 will set the system being monitored to a safe operating status. 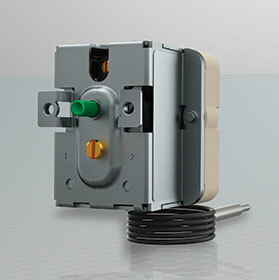 All Jumo thermostats from the heatTherm series come with capillary break protection. In addition, they are characterised by high levels of process reliability and long-term stability. The maximum switching point deviation is only 5% calculated for a total operating life of 250 000 hours. The cadmium-free design makes the device environmentally friendly and RoHS compliant.